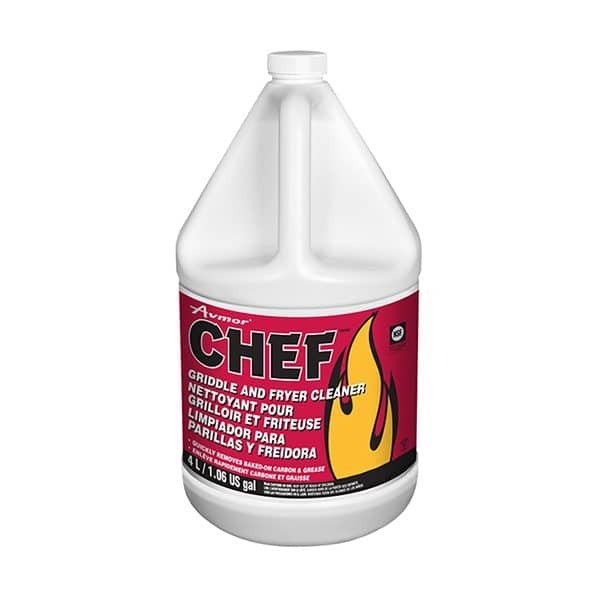 CHEF is a highly effective cleaner for griddles, fryers and ovens. 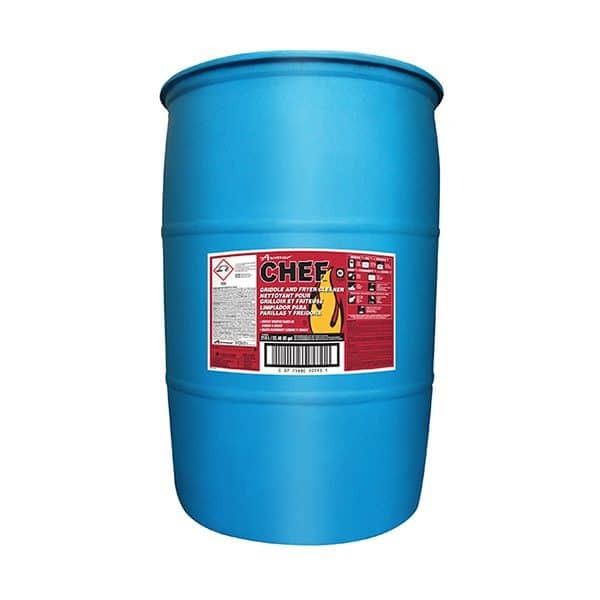 It is formulated to quickly remove baked-on carbon leaving no residue or lingering odour. GRIDDLES: Pre-heat the cooking surface to 80°C (176°F) before cleaning then shut-off. Mix 1 part cleaner to 1 part water and pour directly onto the hot surface. Clean the surface using a scrubing pad. Repeat if necessary. Rinse and wipe clean using potable water. Apply a thin coat of cooking oil to prevent surface from rusting. COMMERCIAL OVENS: Do not dilute. Wearing protective gloves, use a sponge or sprayer to apply CHEF directly to walls, racks and glass. Let CHEF work for 15 minutes. Stubborn areas may need light agitation using a nylon scrubbing pad. Rinse well with potable water. DEEP FRYERS: Empty completely. Scrape-off or hose down to remove excess grease. Fill-up to 10 cm (4”) from top using cold water. Add 1 part CHEF per 25-40 parts water. Boil the solution for 30 minutes. Scrub the greasy residue while it is still warm. Drain and flush off using hot water. Rinse well with potable water before use. Organic compounds of this product are readily biodegradable according to the OECD Guideline 301.